From the boardroom to the garage, our rings for men cover all of the bases. From subtle and sturdy titanium wedding rings to mens diamond rings and black diamond wedding rings, browse our collection of men's rings and you're sure to find that perfect ring. Take a look at our classic collection of customizable signet rings as well. From an engrave-able pinky ring to a larger gold crest ring, we can engrave family crests, corporate logos, custom designs and virtually anything else on a signet ring. Classic men's ring styles have a timeless elegance that remain relevant today and into the future. The classic ring is often represented by the men's plain wedding band, and there are plenty of choices for distinctive plain rings. Plain bands for men typically have a domed or flat exterior shape with a high-polish finish or brushed finish. Many times, you have a choice of metal type, including white gold, yellow gold or rose gold. Palladium, platinum and titanium plain band rings are typically labeled as such for easy identification. The classic plain band looks flattering on most male ring fingers, which is why they continue to be a popular wedding band choice. 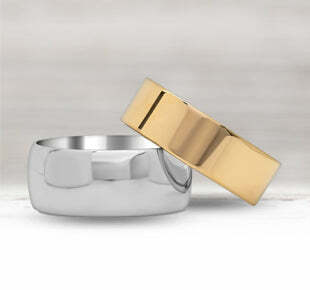 For everyday fashion, a men's gold signet ring looks dashing with suits and casual wear. Raise the level of luxury up one to several notches with men's diamond wedding bands from deBebians. Browse this section to find metal rings featuring diamonds in numerous ways. Diamonds can be set at the center of the ring or all over, which is how they appear on eternity bands. Whatever your preference, we make it easy to wear diamonds your way. If you enjoy wearing rings with more of a creative flair, check out our selection of men's unique wedding bands. Uniqueness at deBebians comes in different forms, so we recommend browsing all sections featuring rings with eye-catching originality. Consider rings with various surface textures and colors.